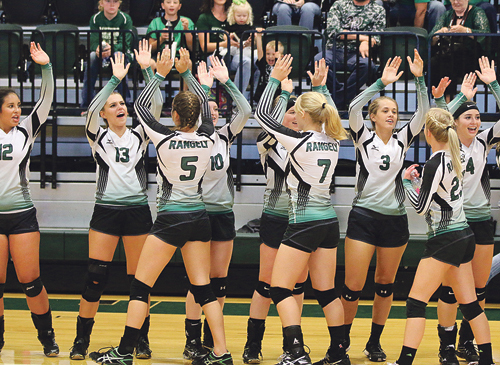 RANGELY | Last Friday the JV Lady Panthers took on the Soroco Rams for our homecoming showdown. JV ended up winning the match in three games. The first set of the match went off without a hitch, Panthers winning 25-7. Second set the team ran into some issues and lost 20-25. They bounced back though, pulling out of a hole to win the deciding set 16-14. It was a hard fought win. Homecoming week ended with a bang, with varsity defeating Soroco in three sets: 25-15, 25-17 and 25-17. Rangely had some great serving by Halie Elam. She had nine earned points in the first set. The ladies found themselves down in the second set, but pushed thru some mental errors to take the second set. Third set was very similar to the first set as Rangely served well. Rangely passed the ball well to execute the offense and had some great defense from the back row. Halie Elam ended the match with 15 earned points, Katelyn Brown with 10 earned points, and Kassidee Brown contributing eight earned points. Klaire Denny and Katelyn Brown both led with eight kills a piece, KK Fortunato and Sarah Connor added seven kills each. Kassidee Brown did a great job moving the ball around to all her hitters. Skylar Thacker and Katelyn Brown led with 15 digs each with Halie Elam adding 12 digs. Currently Rangely is 10-2 and 6-0 in league standings.